A technology intelligence firm called Tech Insights (via TechPowerUp) has dissected an Intel Cannon Lake processor and put it under an electron microscope. 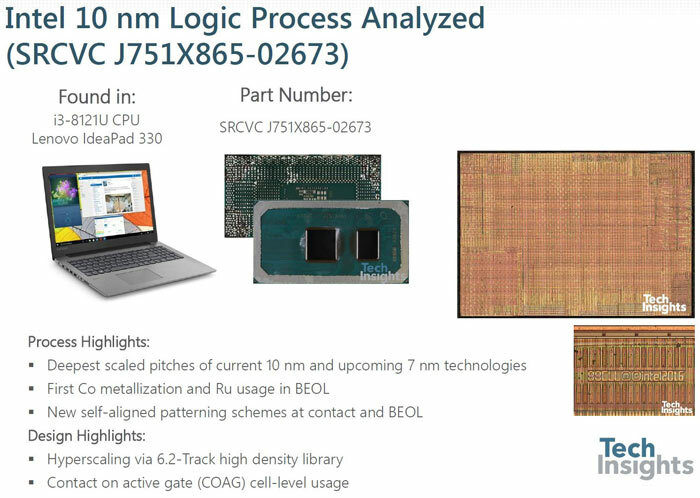 The purpose was to closely check the engineering progress Intel has made in its transition from 14nm to 10nm processors. The biggest single achievement that jumps off the page, and is indeed our headline, is that Intel's 10nm density is 2.7X improved over the 14nm node. 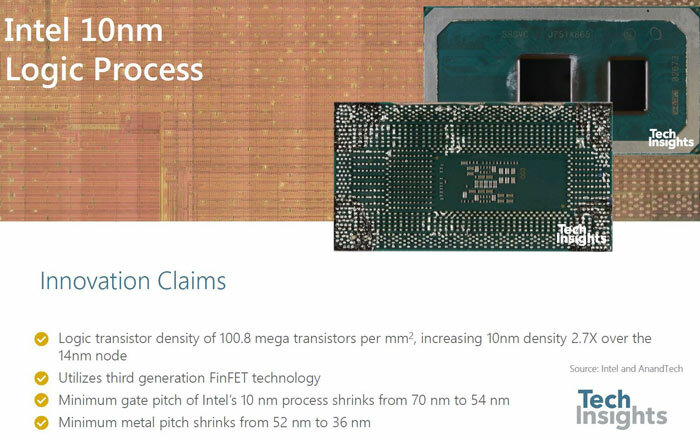 This allows Intel to pack over 100 million transistors in one square millimetre. Looking though the above you will also see noted some significant size savings in transistor pitches. Intel's slow progress with rolling out 10nm Cannon Lake processors must be the result of some technical difficulties it is having. The humble Core i3 in the Lenovo laptop doesn't even have an iGP present or enabled, which might be a clue to the difficulty Intel is having with its process / yields. Meanwhile, AMD CPU plans seem to be advancing nicely and it faces a "generational opportunity" to gain share against Intel, reported CNBC earlier this week. If density the only thing that can be commented on as a dramatic improvement then the rest of the process is just a crippling disappointment. It seems like if Intel ever gets that process working well, it could compete well with other companies' 7nm. I wonder when that will happen. Still dual core? Epic Intel fail. Even the cheapest/lowest end AMD CPU is 4 cores, with or without iGPU! Being fabless means that EVERYBODY else from AMD to Apple can have access to the latest 7nm process from TSMC and Global Foundries. What a joke!